When I think back on this experience and what I hope for my future nursing career, I hope to embody excitement towards diversity as the little children showed me for four weeks. And, I hope to treat people just as Kenya treated me: with lots of love. Of all the emotions I felt driving to the airport with my parents, the one that stood out to me the most was one of extreme anxiety. I was headed to Nairobi, Kenya, for a month-long volunteer opportunity at CFK’s Tabitha Medical Clinic. Working amongst one of the largest urban slums in Africa, to simply put it, terrified me. While honored and excited to begin this journey, I had many questions about my safety and health. Fast-forward four short weeks: my eyes welled with tears as I was leaving what felt like my second home- a place where I was not quite ready to leave. As a nursing student at UNC-Chapel Hill, my role at Tabitha Medical Clinic mainly consisted of shadowing, observing, and learning from the nursing staff. I provided an extra hand where needed, such as taking vital signs, preparing sterile gauze for wound dressings, cleaning supplies used for cervical cancer screening, and packaging/counting drugs in the pharmacy. I rotated in the clinic each day, spending time with a nurse in a new area, which allowed me to catch a glimpse of nursing from distinct perspectives. Just a short year away from graduating nursing school, I felt fairly confident of my nursing knowledge and skills. I certainly did not know everything and had much more to learn, but I felt prepared for the clinic in Kibera. While nursing is a universal concept, the way in which nursing operates is not. When coming to practice health care in a new cultural environment, assumptions, while easy to make, are not at all valuable. Coming from a place where my only clinic experiences were in hospitals in North Carolina (NC), my view of nursing was sheltered. I’ll share a few key examples. 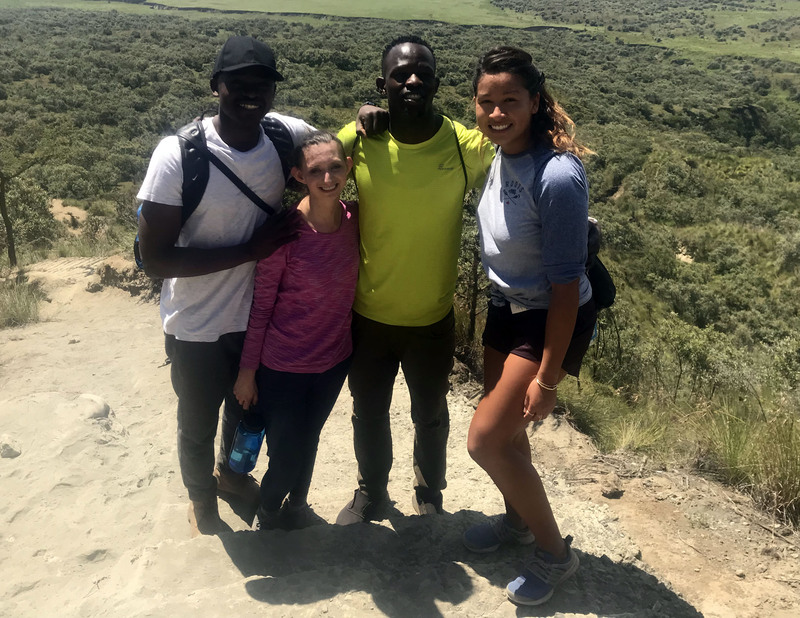 Martha visiting Mount Longonot, an inactive volcano overlooking the beautiful landscape of Lake Naivasha area in Kenya. Being that the clinic was in Kibera, resources were not plentiful. I knew that coming into the experience, but it came to fruition seeing a nurse taking more time than I have ever seen sterilizing the blood-soaked examination table and surgical supplies after a patient came to see her. In my experience in the hospital, the nurses would not have thought twice about the situation, as the cover on the table could be thrown away with no worry about having enough protection for the next patient. Never have I heard “that was a big loss” when a nurse dropped gauze on the floor and had to throw it away. Resources are easy to come by, right? Not for everyone. It’s easy to drive or use a helicopter to deliver medical supplies, right? Not when the clinic is located in the heart of a slum. In addition, an interesting aspect I was able to compare between my experience in NC and the clinic in Kibera was mental health. Mental health is becoming a powerhouse topic amongst hospitals and classrooms in NC, and the topic at the clinic minimally addressed. But, when I reflected on this and thought of the infamous “Hierarchy of Needs,” the nurses in Kibera needed to address the patient’s physical needs first, such as food security and access to clean water. While there are populations within the United States that face poverty, many populations do not face this challenge; therefore, nurses can spend time counseling and utilizing therapy on a more ongoing basis. With all of this in mind, the nurses in the clinic faced an extremely different day-to-day routine than a typical nurse I have worked with thus far in school. When coming into this environment, it’s easy to assume you have the knowledge and skills needed to succeed, but it just is not that simple. Each culture has its own needs and its own population that the nurses are specifically trained for, so before acting like you know exactly how nursing works in each situation, think twice because you are most likely wrong. 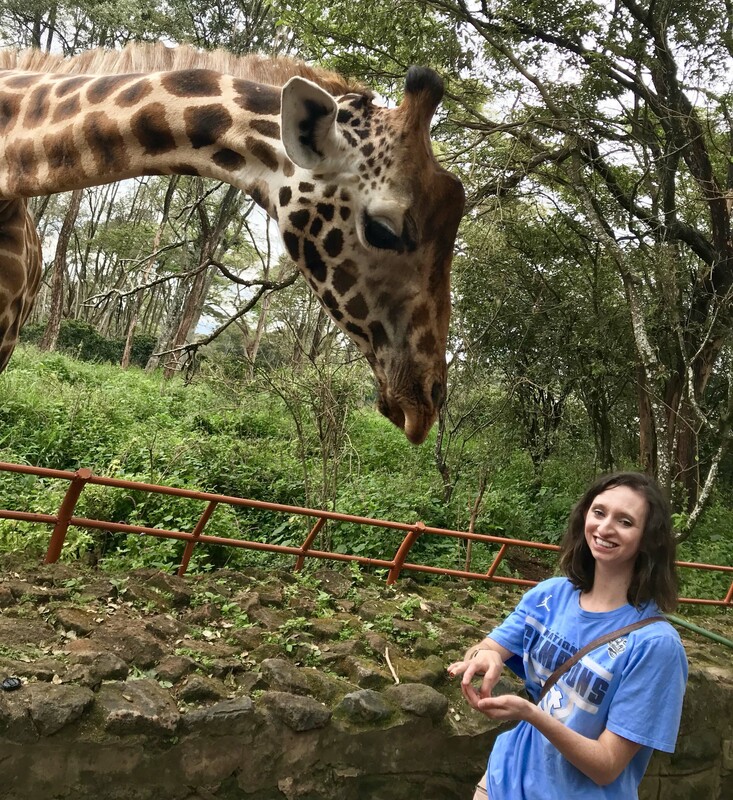 ‍Martha visiting Giraffe Center outside of Nairobi in Karen, Kenya. Even from a more broad perspective, it is easy to pass judgments on the environment and surrounding area in which one works or volunteers. One of my biggest fears going to Kibera was safety, as I had not a clue what to expect. I knew I would stand out, and I was anxious as to what that attention might bring. Well, my heart was so full after finding out what the attention brought. Once I learned my way to the clinic and back, I would often walk alone. Each day, children would be walking to and from school when I would be going back and forth from work. As soon as they would see me, after saying “Mzungu, how are you?’ they would run to me with the most genuine smiles and laughter, just wanting to touch and feel my hand. Never once did this community make me feel unsafe or insecure. In fact, I felt so much more welcomed than I could have ever asked. So, when I think back on this experience and what I hope for my future nursing career, I hope to embody excitement towards diversity as the little children showed me for four weeks. An excitement that I hope will motivate me to respect and develop relationships with people that look and believe very differently from me. I hope to never pass judgment, but to look at a new situation and learn from it so that the patients I care for will have more positive outcomes. And, I hope to treat people just as Kenya treated me: with lots of love.